my name is elena and i am a personal chef and caterer (small scale) with a passionate interest in healthy and beautifully presented food. not only am i enamored of food, but am interested in the connection between nature, writing, and art in relation to food. i have always been strongly influenced by the use of color: in the dishes i create, the pottery i collect, the watercolors i paint, and the vibrant colors of nature. recently it has been scientifically proven to be beneficial to ingest vividly colored foods due to their natural antioxidant properties and other health benefits. 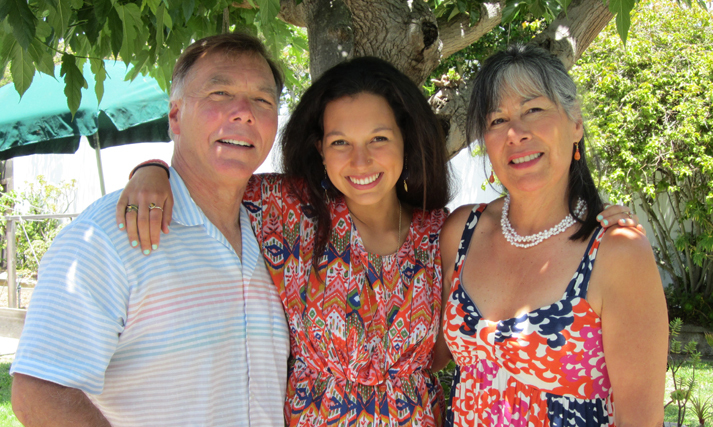 at present i am an “empty nester” with my only child, domenica, just off to college. as with many stay-at-home moms, once your child is off to college, there is opportunity and time to pour yourself into new and exciting endeavors. this is a new stage in our mother-daughter relationship and one we are both embracing. my thinking is that a blog about food (and related subjects) will enable me to remain connected with my daughter, my nieces and nephews and their peers. in the end, what really matters is family and friends and how many memorable meals you’ve shared over the years, right? like so many food writers and chefs, i’ve been influenced by past generations. my parents grew up on southern california farms, my mom on a dairy farm and my dad’s family owned a produce farm with a small general store. fresh daily harvested produce from my dad’s farm was taken and sold at the original L.A. FARMERS’ MARKET. my italian nonna (grandmother) prepared meals for 20 people (dairy crew and family) multiple times per day…all from scratch. both my parents were children of immigrants and i feel this “old country” ethic (hard work, fresh food, kitchen gardens, lots of dinner parties and socializing) has strongly influenced me. since i desired to provide the healthiest food choices for my own family, this led us down the path of growing much of own our produce. which, in turn, enlightened us as to the seasonal availability of fruits/vegetables. so, most dishes/recipes that i create are inspired by the season and what is prolific in our garden. there is a great sense of independence when visiting the supermarket knowing that you don’t have to rely entirely on corporate agriculture for your food. even if you aren’t interested in growing your own produce (or don’t have the time), a small pot of herbs, tender lettuces or a fruit tree or two will provide an ample harvest. not to mention, the financial savings you will enjoy simply by making a few small changes to your grocery routine. many years ago we decided as a family to bring our lunches to school or work as often as possible. we also decided that dining out wasn’t in our best health or financial interests. since then we have reaped substantial savings in cash which we’ve used for traveling over the years. with a little planning you can easily re-create many of the processed foods you purchase at the supermarket and for a fraction of the cost. i test new recipes daily, create recipes based on a particular craving, “tweak” recipes to suit my taste and/or what i have on hand in the pantry, garden or refrigerator. i welcome you to ask questions about specific ingredients, recipes or techniques, as well as the latest news with regard to healthy products. when you think of how colors affect you and how they are vital to your emotional and physical health, you can better understand the need to “eat all the colors of the rainbow.” color is not missed until it is taken away. imagine all white or beige foods on a white plate. visually and nutritionally, this would not be optimum for your health. so, let’s get started bringing vibrant colors and colorful fresh produce into your kitchen and reap the health benefits in so doing. i hope you will follow colormykitchen.com where i will provide tested recipes, kitchen tips, cost saving strategies and creative suggestions among other topics. all with vivid colors in the forefront to nourish our senses. all with the goal of keeping our individual bodies and the health of our planet optimal…and connecting us to one another. i dedicate this blog to my daughter, domenica, the best sous chef ever, coffee date partner, aspiring future chef and bright star in my life. and, to my husband, dave, my ultimate recipe tester, warmhearted partner and supporter in all things.